I LOVE HOW GRATEFUL MY TEEN IS FOR EVERYTHING I DO FOR HER - ProudMummy.com the Web's Community for Mums. 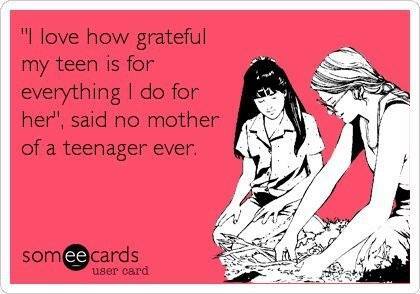 "I LOVE HOW GRATEFUL MY TEEN IS FOR EVERYTHING I DO FOR HER" SAID NO MOTHER OF A TEENAGER EVER. Looking forward to our 11 year old leaving home...thats normal right??! It starts before the teen years!! Thimk this applies to 9 year olds too! !